Even if....or maybe especially if...you have a large selection of maps, sometime you just need something quick and easy. 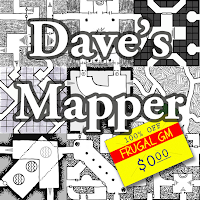 Dave's Mapper is definitely quick and easy.....and pretty fricken cool to boot. A quick overview: you can quickly make a number of map types (Dungeons, Caverns, City, Side View, and Sci-Fi Ships). Select a type and your desired size and whammo! A new map is made. You can deselect map tiles from certain artists, if you wanted, and editing the new map is quite simple. Dave's Mapper is easy enough that you can use the website from your tablet. There are tons of options for creating a map: size, offset, grids......you can even create foldable map cubes! Although there are already 32+ artists creating tiles, the program is still accepting new tiles and there is a weekly contest (#TileThursday) for new tiles. 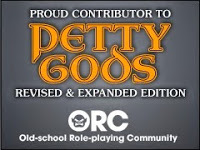 This is a great project and a wonderful tool for GMs.